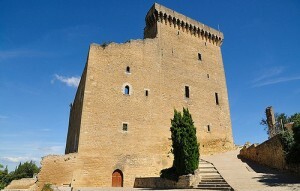 The plain of the Comtat Venaissin, the former papal territory (1309-1404), is dominated by the vineyards of Chateauneuf du Pape over 7900 acres, and his fortress of the 14th century. 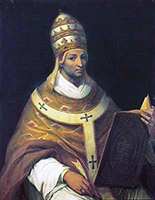 Pope John XXII, the second pope installed Avignon, decided to build their summer residence. Thanks to him that the vineyards of Châteauneuf-du-Pape have been developed. John XXII brought with him from Cahors some wine growers and bankers in order to enhance the wealth of the papacy “decentralized”. These winegrowers have recuperated old plots of vineyards abandoned by the Templars hunted by Philip Lebel and will implement the major foundations that will enable the development of the vineyards of Châteauneuf-du-Pape. In 1325 the papal vineyard was covering 20 acres of vines. 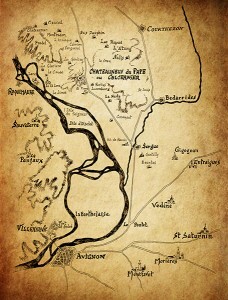 During the pontificate of Clement VI, in 1344, the first known vineyard of Châteauneuf-du-Pape was listed. In the XVIII century, the vineyard was mainly boosted by the local aristocracy. In 1748, the wine of Château de la Nerthe was already exported. In 1877, Joseph Ducos, a former military officer, bought the CHATEAU DE LA NERTHE and its 59 hectares of vines largely decimated by phylloxéra in 1866. His wife, Zoe Berton, was the daughter of Léon Berton, owner of Domaine Condorcet. It is important to note that Amable Berton, the Zoe’s grandfather, was the first to introduce the Syrah variety in Châteauneuf du Pape in 1830. Determined to solve the problem of phylloxera, Joseph Ducos uses in 1877 his engineering training to understand that the solution to fight against this scourge will go through the use of American rootstocks. The opportunity for him, through his extensive research, to introduce new varieties in the appellation: Cinsault, Counoise, Grenache, Mourvèdre, Muscardin, Picpoul, Petite Sirah, Vaccarèse, Bourboulenc and Clairette. Ten of those selected varieties are still enshrined today in the thirteen varieties of the appellation decree. 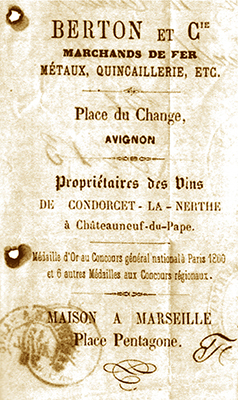 After rebuilding the vineyard, in 1890 he bought the 37 hectares of Domaine Condorcet (including 5 hectares in the town of Sorgues) to his father-Amable Berton. 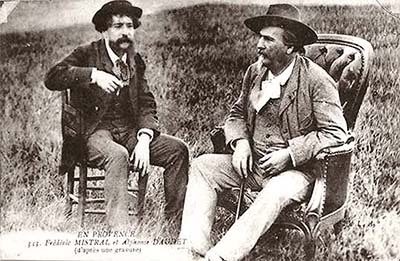 Note: Alphonse Daudet (Tartarin from Tarascon, Letters from my mill …), Provençal writer playwright, was one of the member of Félibres (Association created in 1854 by seven young Provençal poets with Frédéric Mistral and Anselme Mathieu). He took part and most often to their joyous carousal; particularly with Anselme Mathieu from Châteauneuf-du-Pape. So he knew all the interesting corners of the terroir. Condorcet, dependence from Nerto, Provencal farmhouse half farm, half castle, served to Daudet accurate model for the description of the Mas du Castelet in his novel Sappho (1884). Today the vineyards of Condorcet, belongs to the family Bouche, who acquired it in the early twentieth century (At the time more than 173 acres of meadows, a source, and a fountain in the middle of the courtyard of this which had become more a farm than a winery.). They begun to plant vines in these grasslands from 1920, however, the grandfather of the current owner, decide to squander much of that heritage to live a life of Epicurean. Gérard Bouche, his little son rebuilt patiently to make the vineyard reborn. He currently operates the vineyard with the help of his wife Sylvie and his daughter Anaïs. The vineyards whose average age is 40 years, now extends over 37 acres of Châteauneuf du Pape, 15 acres of Côtes du Rhône and 12 acres of table wine. hectares de Côtes du Rhône et 5 hectares de vin de pays.  The vineyard is present on the 3 towns of the appellation Châteauneuf du Pape, Bédarrides and Sorgues and is spread over the lands of Cansaud, St. John Coteaux, Font de Michelle and Plan du Rhone. The terroir is mainly composed of rounded pebbles that one of the features is to store the heat of the day to restore it to the vines during the night. The current plantings includes 7 of the 13 grape varieties : Red Grenache, Syrah, Cinsault, Mourvèdre for the red, and Bourboulenc, Clairette, Roussanne for the whites.